Orange + Black = Green? Ghosts and goblins and ghouls, oh my! ‘Tis the season for haunted happenings, which our kids look forward to almost as much Christmas. Honestly--what child isn’t excited about eating copious amounts of sugar, staying up late, scaring her siblings, and partying at school? Can you blame our little pumpkins? I’m guilty of fueling the kids’ holiday enthusiasm. I love holidays. Halloween isn’t my favorite, but it’s still an excuse to celebrate. I’m such a sucker for elaborate costumes, overflowing treat bags, and cupcakes with gobs of icing...mmmm, cupcakes. So, after failing last week’s Official No Impact Week experiment, I thought I’d get back on track with our family’s original project: to minimize our impact on the environment. For those of you who are kind enough to check in here on a regular basis, you might have noticed that the posts trickled off regarding our progress during No Impact Week. You know what? It was too much, too soon for us. We tried. We ate more local food, we discarded less trash, we upped our composting, we traveled less. We’re honestly pretty good with watching our energy and water consumption--we buy Energy Star products, I use drip lines for watering the garden (and only when it really needs it), we’re going to invest in rain barrels, we wear sweatshirts inside instead of cranking up the heat. The last two “project” days, I’m ashamed to admit--I couldn’t pull them off. Saturday, we should have participated in an activity to “give back” or make a positive impact on the Earth...but Kristen had a five-hour Pony Club Halloween party. It was a really cute party--very environmentally-friendly. The girls bobbed for apples (but the horses went first--yuck! ), dressed up the ponies in costumes, ran three-legged races, hopped in used horse feed bags for sack races, played hide-and-seek in the barn, and took an after dark, “spooky” walk along the trail. A great day, but not exactly what was slated for No Impact Week. Sunday was to be an “eco-Sabbath,” a day to reflect on our week-long activities and determine what we did right...and not so right. Instead, we frantically cleaned the nasty house to host my sister’s birthday dinner. I didn’t even serve local food. Anyway, we’re back to our original family project now...looking at our daily lives and trying to figure out how to be “greener” without losing our sanity. 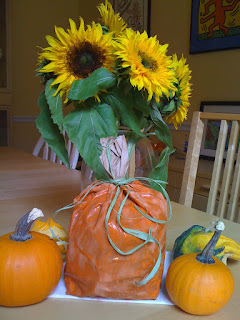 Since we have a major event at week’s end, let’s chat about greening Halloween. Traditionally, I’m the obsessive-compulsive room mother...over-scheduling the class Halloween party to ensure that frantic fun is had by all. Last year, for Kristen’s second grade class, we made a bat craft (all elements bought at Michael’s, with nothing remotely recyclable), played a game where the kids turned each other into toilet paper mummies (not recycled), served treats such as a plastic “glove” filled with popcorn, plastic bags filled with individually wrapped candy, and drinks served in plastic cups--not recycled. The first item on my list is the plastic treat bag. I’m not doing it this year. Instead, I’ve decided to enlist our kids to help create treat bags that can be recycled or composted after their guts are depleted. Unfortunately, the treats inside are still individually wrapped candies. I hate the packaging waste, but I also understand the need to give out treats that the kids will be allowed to eat. The world is a little too scary to allow our kids to eat unwrapped candy or other treats from strangers. I actually considered the option of buying Fair Trade candy...but balked at the cost to fill 30+ treat bags. Sorry. If you want to hand out Fair Trade candy, let me know, and we’ll be knocking on your door. In fact, I’ll tell you a bit more about a cool reverse trick-or-treating program involving Fair Trade chocolate...tomorrow. So, I’m feeling a little better about eliminating the plastic treat bags. Now what else can we do to “green up” the party? Old clothes. Not a problem. I have plenty of clothes in my closet that, unfortunately, don’t fit. Long-sleeved shirt, overall or jeans, socks and/or boots, garden gloves, topped with a classic straw hat...I know we have all of those things cluttering closets here. Newspaper to stuff our friend. String or twine (to tie the cuffs closed). An old pillowcase for the head. Safety pins, to help hold all of the parts together. Pencil and markers for the face. To assemble a scarecrow, tightly tie closed the ends of the pants and sleeves on the shirt. Stuff the clothes with newspaper. Stuff the socks, tie closed, and tie or pin onto the pants. Stuff the gloves, tie closed, and tie or pin onto the bottom of the sleeves. Tuck the shirt into the pants. Draw the scarecrow’s face onto the pillowcase with pencil, then color with markers--preferably permanent ones if you plan to put it outside. Stuff the pillowcase and fasten it to the shirt/body. For finishing touches, add the accessories of your choice--bandana, hat, belt, whatever items you no longer need and can recycle for your scarecrow. Then, when you’re done--please send me a picture, and I’ll post it on the blog! It’s the Green Pumpkin, Charlie Brown! And please--share your great green Halloween ideas here...I'd love to hear your ideas!